"YOU DERSERVE A BREAK AWAY" in a peaceful but vibrant surroundings. 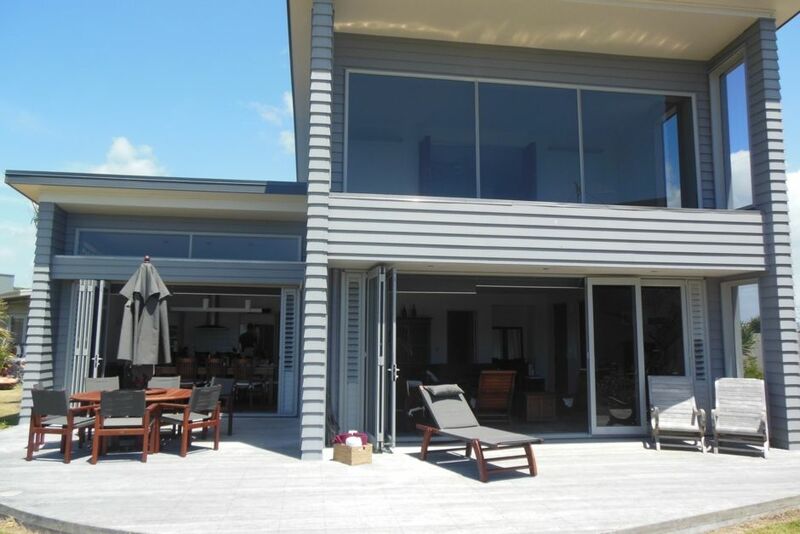 This large holiday home offers a place where there is no boundaries between you, the ocean and the white of OMAHA BEACH except the large open green space of the beach reserve, A superb home with a feeling of space and privacy. Surrounded by established gardens the landscaping compliments a private walled courtyard and large open decks with lots of outdoor furniture to accommodate all the guests, from the breakfast on the deck to all day sun lounging. Even a short stay at "Pips Place" will revive you in no time. Built over 2 levels the house has 5 bedroom 2 1/2 bathrooms and a family room for extra guests. The ground floor of the house is light and spacious with high ceilings that add a great ambiance to the home. This area houses the large lounge a large dining area , superb kitchen and 3 bedrooms. On the second level you will find the master bedroom with a super King bed and ensuite bathroom. This area of the house enjoys nice views of the beach and is a peaceful spot to catch up with the holiday reading. Also on this level is the family room with a second TV and a great room for kids to play . There are 2 day beds in this room providing extra sleeping space for adults or children. The large lounge offers seating for everyone and has a 52 inch Plasma and SKY TV. The gas log fire is a winner for winter stays but will be appreciated on those balmy summer nights after a late swim, add some candles and a wine and create a GREAT PLACE TO UNWIND. The kitchen is modern, complimented by granite benches and caters well for corporate groups or family occasions. No large gatherings of guests are allowed on these premises, without the prior written approval of the property manager. involving large numbers of guests. Failure to adhere to the Terms and Conditions of Hire will mean immediate termination of your tenancy. Thank you for checking our Beach Houses. We are a family run business that are all about our local community, we can give you the inside on the Matakana Region. We strive to provide you with your desired break and are here to help with whatever that looks like for you. Our houses are always presented in top standard and ready for you to walk in and relax. Our Beach Houses all have something different and unique to them - let us help you find the perfect one! We are available to you at any stage and can offer numerous services, from linen, to catering, babysitting, even unpacking your supermarket delivery. TWO LIVING AREAS, MANY AMENITIES. Salt, pepper, oil, tea, coffee and sugar. The amount left will be sufficient for a day or two depending on your use; it is left for your convenience only, not as a supply for your entire stay. Wow factor when you walk and then beyond in so many ways! Very close to beach; great open grassy reserve to play on just outside the house; lovely warm and inviting furnishings; will come back again.